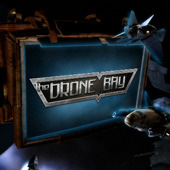 CrazyKinux's Musing: The Return of The Drone Bay - This Time it's for Real! I am purely here to crack that whip. TWO WEEKS BOYS!! TWO WEEKS! It's about TIME!!! Looking forward to listening to this one...and future ones!!! Thanks Mandrill - I've actually removed that section as I'm about to make an update to the whole EVE Podcast listing!